Question: How is Melt and Pour Soap Base Made? Today's Mailbag Monday is actually from no one person in particular, but is probably the question I have gotten the most often that I don't actually know the complete answer to...until now. That question? "How is melt and pour soap base made?" We've all probably used melt and pour soap base, but few, if any of us, have ever made it. 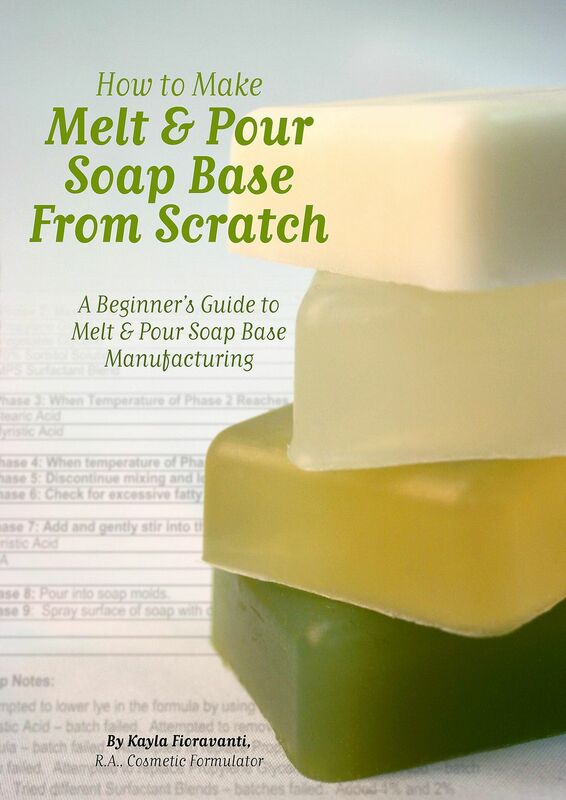 Well, Kayla Fioravanti, of Essential Wholesale is about to crack your soap making brains wide open with her new book, "How to Make Melt and Pour Soap Base from Scratch - A Beginner's Guide to Melt and Pour Soap Base Manufacturing." How do you do it? From my understanding of ingredient labels, and a basic understanding of soap chemistry, I knew it involved adding an alcohol to the soap to effectively lower its melting temperature - similar to adjusting the formula of a whipped body butter to give it a higher or lower temperature. But that's about where my knowledge and understanding left off. It's always been on my "to learn" list, but I'd just never taken the plunge to actually figure or find out just how. Well, Kayla did. As she said in an interview on the Indie Business Blog, "I can’t count how many times over the past few years that I have been asked if I know how to make Melt & Pour soap base (M&P) over the past few years. Soapers are naturally curious, and enjoy the hands-on experience of making their soap from scratch. I originally formulated these recipes to manufacture at Essential Wholesale. But I kept putting it off because we didn’t have the space to cool 8000 lbs of packaged M&P." After poring over a preview copy of the book, making the base is a lot more complicated than I expected! No wonder more folks don't make it themselves. But...I must admit...complicated or not, I am definitely going to try some out! And quite wonderfully, the book contains more than just recipes and "how-to" on melt and pour soap base. Her chapter on "How to Turn Your Hobby Into a Business" contains a Top 10 list that should be required reading for all soap makers. The book also has chapters on "Good Manufacturing Practices" and a great explanation of the differences between soap, cosmetics, and drugs. So even if you never plan on making melt and pour soap base from scratch, the information on soap in general and on building a soap making business is excellent!